Over the last two years this time of year has been a proverbial revolving door when it comes to head coaches in college football. This year, not so much. The main reason is that nearly all of the major college football programs have hired a new coach within the last three years. Look at the major college football conferences: ACC, Big Ten, Big 12, Pac 12 and Sec. After the 2012 and 2013 seasons there was a total of 24 coaching changes. Between those five conferences this year there will be three coaching changes (give or take). This is the first time since 2006 that the SEC isn’t changing out a coach. The man who changed that in 2007, Nick Saban at Alabama. Most people felt back in September that the two biggest job openings this year would be USC and Texas. USC has already been opened and filled. Lane Kiffin was fired (not surprisingly) by USC back at the end of September. 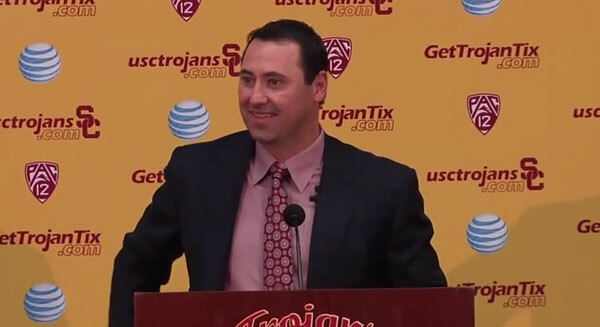 He’s been replaced by Washington Head Coach and former USC assistant Steve Sarkisian. The Texas job, as of this post, will open possibly by the end of the week if the reports are correct. This will be the biggest job out there by far with all of the resources, money and pressure one could want. Next year could bring a back the typical ‘silly season’ but let’s hope, for the coaches and the fans, that it comes around as often as the World Cup because it can drive people, well, silly.